A normal walk with Jesus involves experiencing daily, in our lives and churches, what we read about in the New Testament. Orderly, acceptable worship still requires manifestation of the gifts of the Holy Spirit, just as it did in the model established for us in the 14th chapter of 1st Corinthians: "All of these must be done for the strengthening of the Church" (vs. 26). It is abnormal to expect anything less. Throughout the centuries, people have tried to write off important aspects of the normal Christian life, calling the baptism and gifts of the Holy spirit a "passing phase" or "meaningless emotionalism." Nevertheless, they remain. Without these charismatic elements, people slump back into the boredom and unfaithfulness of the abnormal Christian life. Thus, the range of normalcy includes anything and everything that happened within the context of the ministry of Jesus and the New Testament apostles, and that includes some very unnatural, even bizarre, behaviour by worldly standards. Excerpt from Rev. 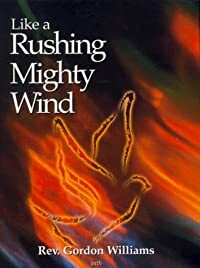 Gordon Williams', "LIKE A RUSHING MIGHTY WIND." Practical and important Christian teaching highlighting the Baptism of the Holy Spirit and the 9 Gifts of the Holy Spirit as outlined in the Book of Corinthians. This is a book with solid answers to the deepest spiritual questions. One of the most comprehensive works on the ministry of the Holy Spirit, this is a practical guide to finding the ultimate fulfillment in the Christian life. Copyright © 2016. The Gordon Williams Evangelistic Association. All rights reserved.